Here is an ATmega8 based USB programmable POV Training kit. This kit was designed for students those who are very much interested in working this POV concept. No need of any external programmer. you can directly program this kit from your PC/Laptop USB port. After a lot of handwork we finally came out with our best design. For your technical and financial support. Before programming the device first the USBasp drivers must be installed in the PC/Laptop. All the necessary soft wares and documents will be provided along with the KIT. 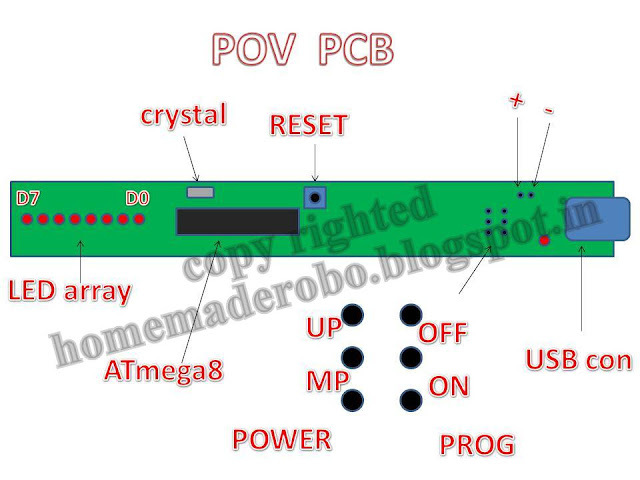 This is the basic block diagram of PCB of POV kit on which you can observer the locations of and arrangement of components. sir i have attended to ur workshop conducted at geetams university. i have not recieved cd regarding pov workshop which includes how to assemble,programming etc. please send a soft copy regarding to my emailid kondreddy.sai39@gmail.com. ur workshop on pov is exellent it helps me if u send me a soft copy please sir pleaseeeeee.. Thanks for sharing such a nice information. Tickerplay Signs and Displays from USA offering different kind of programmable led signs in a very affordable price.